It is the sub gem for Saturn and Dragon's tail. It is useful for liver troubles. 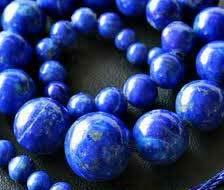 Majority of Lapis stones are mined fro Afghanistan. 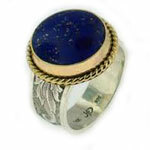 Lapis has a deep blue color with tiny flecks of gold. It has often been compared to a clear, dark star-lit sky. For believers, lapis is said to improve psychic powers, overcome depression, and achieve a balance in the yin and yang energies. In general, many consider this stone to be protective of the wearer from physical and psychological dangers. When it comes to meditation, it is believed that holding on to a piece of lapis helps one in the visualization process by serving as a deep blue focal point of concentration. 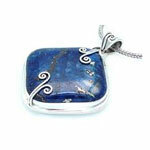 Lapis is believed to help a person be truthful, open, intuitive, and powerful. 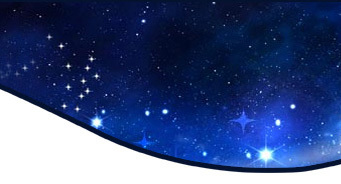 A wide range of believers have commented on its ability to strengthen the physique and spirit thereby aiding in one's spiritual evolution, and in connecting with the heavens. Gemstone Tiles : are also designed and manufacturer in all stones according to the house interiors and vastu shastra. Prayer Beads : also manufactured in all shapes and stones as per the requirement using silver, gold & metal.